Maybe you just don’t have as much enthusiasm as you once did. Maybe you are just burned out. Could it be that you find Bible reading to be drudgery? Do you pray as you once did? It may be the most challenging four hours of your life. But if you will commit to attending Transformed and apply what you hear, we guarantee…you will never be lukewarm again. Promise. If we don’t deliver, then you will get a full refund. Wait, it’s free…now you have absolutely nothing to lose. You will pray harder, read the Word with gladness and you will appreciate and love the Lord more than ever before. What do you say? Have you always wanted to be an on fire Christian who never flames out? Have you always wondered what was missing? Join us for Transformed. We can’t wait to see you there. For more details on this conference, visit Transformed. The Way of The Master also provides EXCELLENT resources for learning how to share your faith, so that the lost may find salvation through Jesus Christ. continue reading "How to Get on FIRE for God"
during a visit to South Africa. 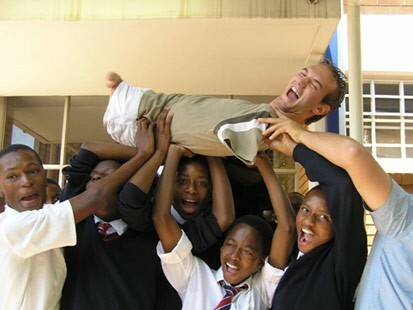 The crowds that 25-year-old Nick Vujicic draws as an evangelist would have been unimaginable only a few years ago, and impossible had he been born under other circumstances. "In some third world countries ... I would be seen as cursed, a shame to the family," said Vujicic (pronounced VOY-chich). "The possibilities of me being killed at my birth would have been quite high." on "20/20" at 9 p.m. ET. But Vujicic, who was born without arms or legs, does have one of the most powerful of all human attributes: a voice. Through the ministry he calls Life Without Limbs and a motivational program titled "Attitude is Altitude," Vujicic said he has made 1,600 speaking appearances in 12 nations. "No matter who you are, no matter what you're going through, God knows it," he said. "He is with you. He is going to pull you through." Read the entire article here. You can also view more pictures and videos of Nick's childhood, as well as his ministry. the HOPE and VICTORY that comes from JESUS alone. continue reading "Born Without Limbs, Refusing Limitations"
SPLAT EXPERIENCE is a Christian Performance Art ministry founded in April of 2002 by George Paiva and Marc Eckel. The ministry's goal is to encourage worship in the church and to proclaim Jesus in local communities. Our painting presentations are approx. 8'x8' and are painted to dynamic Christian music soundtracks in minutes. Our worship mural project is a 45-minute worship concert with a full band. Do you sometimes feel like you’re just going through the motions of the Christian life? If you answered yes, then perhaps God is calling you to something deeper. The purpose of Seeking Him is to reveal more of God and His ways to you, to gently expose your heart and to lead you on a pilgrimage toward a deeper relationship with Him. Take the Seeking Him journey with God-and watch Him explode in power and freshness in your life. Seeking Him is the ideal study for small groups looking to make a serious investment in spiritual growth. God promises to meet you when you seek Him together. Seeking Him is designed to help you set the stage for a greater work of God in your church than you have ever dreamed. "Forgiveness. The gift everyone wants to receive but finds hard to give. It’s not easy to forgive. Yet forgiveness is one of the most important elements of personal and corporate revival." You can also read testimonies, listen to recorded prayer times, and even register your group! Why wait? Experience the JOY of personal REVIVAL today!! continue reading "A Bible Study on Personal Revival"
Celebrate the resurrection of Christ! He Lives!!! continue reading "In Christ Alone"
It was a surprise for Simon. He was from North Africa, and to be in Jerusalem for the Passover was a dream come true. But a surprising thing happened. Jesus stumbled under the weight ofthe cross, right in front of him. Roman soldiers could draft anyone into their service with thetouch of a spear blade. Simon was the closest person, so hewas forced to pick up the cross and carry it, a humiliating task. Mark recounts the same story but adds another detail - Simon was the father of Alexander and Rufus. It's unusual for a father to be identified by his children, unless the children are quite famous. By the time Mark's Gospel was circulated, two of the most famous Christians in all of the empire must have been Alexander and Rufus. The Roman soldiers - Jesus' executioners - had crucified many men by nailing them to wooden crosses. As the dying men would scream and suffer, the soldiers would sit at the feet of the crosses and play games-desensitized to the incessant curses and pleas. They prided themselves on being people not caught by surprise. Yet never before had any one of them heard what Jesus said. It was enough to shock the toughest veteran. So it's no wonder that when the centurion made his final inspection after Jesus'death, he said "Surely this was a righteous man" (Luke 23:47). Like the convict on the far side who insulted Jesus (Luke23:39), this man must have come to the cross with knowledge of Jesus. He understood Jesus was no criminal. Even more important, he must have realized Jesus was God's Son who was headed back home to the paradise from which he had come. Of course, Jesus said yes. He was being crucified for this very purpose - to save sinners and to promise heaven to all those who ask. by the author or Christianity Today International/Today's Christian magazine (formerly Christian Reader). at Christianity Today on the resurrection of our Lord Jesus Christ. 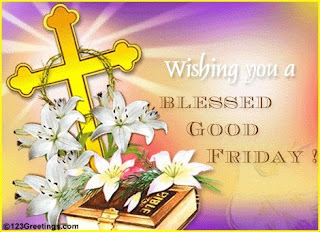 continue reading "Good Friday Surprises"
With this weekend being Easter and today being Good Friday Learn Out Loud is happy to bring you a free full-length audiobook entitled The Practice of the Presence of God. The book is written by Brother Lawrence in the 17th century. The Practice of the Presence of God is a description of his constant reflection and attention to God throughout all of his daily activities. "My most usual method is this simple attention, an affectionate regard for God to whom I find myself often attached with greater sweetness and delight than that of an infant at the mother's breast. To choose an expression, I would call this state the bosom of God, for the inexpressible sweetness which I taste and experience there.” This is how “Brother Lawrence” describes his constant practice of speaking with and reflecting upon God amidst the mundane tasks of life. Nicholas Herman (c. 1605-1691) was born in Lorraine, France, and served as a cook and shoe repairer at a Carmelite monastery. He was only a lay member of the order, and walked with a limp from injuries incurred as a soldier, yet his private thoughts provide a wellspring of devotional insight and refreshment. " This title is made available for free thanks to ChristianAudio.com. We encourage you to visit their website for more thoughtful Christian audio titles. Pick up your copy of The Practice of the Presence of God today! continue reading "Free Full Length Audiobook"
You think you’ve gone as far as you can go—you’ve done all you know to do—but there’s Easter, and the victory says…you can always "go a little farther" because He already has—you can! Now as you live and move and have your being in Him—you can go a little farther for His Glory! continue reading "Persevere in Christ!" R - Repent of your sins! Just as heat forces impurities to the surface so the metal refiner can remove them, your prayer time will reveal attitudes that must be changed, habits that must be broken, and barriers to blessing that must be removed. It's not enough to tell God about your sins. He already knows them. You must ask Him to help you turn away from them. This is true repentance. A - Ask for yourself and others! Your prayers invite God into the situation, and your faith activates His power to change it. There's no distance in prayer, no culture or language barrier it can't overcome. It's like throwing on a power switch - things begin to move when we pray. Jesus said, 'I will give you the keys of the Kingdom of Heaven ... whatever doors you open on earth shall be open in Heaven' (Mt 16:19 TLB). Y - Yield yourself to God's will! Declaring the Lordship of Jesus Christ in your life is like signing your name to your autobiography, and inviting Him to write your life's story. continue reading "Prayer Changes Things"
why all these trials are thrusk upon man? Right now, there is just no theory. we end one battle and another begins. take some time and sit at my knee. He wants to sift you like wheat and leave you no power! Spend Time on your Knees, and Seriously Pray! and wants to come in and strike with that Roar! What does my Word tell you to do? Obey me Child, and I will see you through. He is trying hard child, to take you out of this race. You must guard your heart child, for he is no fool. he would like nothing better then to end your life. Listen to my voice, and do it with speed. Lay down your life and and put an end to all strife. It opens doors, and will plant the wrong seed. Let me refreshen you, and in Me you will see. Abide in My word and close by me, just stay. Now Child, stop struggling and don't let him impose. I raise up my Hand and speak Peace to those too! I walked this earth and suffered much more! Do you not recall Child what I suffered for you? To feel rejection, pain and distress. But I trusted in my Fathers Heavenly Rest. On Me you must Depend child, and not on Man. But for now Child, there are many fences you must mend. I watched over you, as your dear mother gave you birth. Stop allowing others to affect you as they do. and for now my child, on this earth you must stay. I have removed their sting, now what more can they do? and In me Child, you will find your Delight! "Prayer is designed more to adjust you to God, than to adjust God to you and your desires." - Oswald Chambers/"My Utmost For His Highest"
* Individual Christians and Churches today need to see the vital need to humble themselves before God, and to fervently pray & hungrily seek His face, and to turn wholeheartedly back to Him, or there will be NO POWER in what they do. We need to learn what the early church in Acts (see Acts 1:14, 2:42-47, 4:23-33, 6:4,...) knew - that there is a DIRECT CONNECTION between prayer & submission and God's Holy Spirit filling and emPOWERing them. The more they prayed, the more God did in and through them. They PRAYED for 10 days straight, then Peter preached for 10 minutes, and 3000 people were saved. This is a place for the entire family to gather, learn and enhance their faith. We are here to give you an opportunity to play, think, grow and love. In His Hands is a place to pray, a place to play. 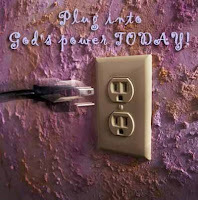 continue reading "Plug into GOD'S POWER!" Jenna is the owner of Choosing Home, a ministry that exists to encourage and support women who are desiring to deepen the relationship that they have with their children and their husband, through their time spent at home. Come and learn new and helpful ways to be skilled and efficient in every aspect of home-management. Visit Choosing Home for daily ideas, motherly musings, God-ward thoughts and grins. Join the internet forum for lively discussion about "all things" relating to choosing to be home full time. Being home is not a "second rate" option. For Choosing Home, it's a Holy Calling, a grand adventure, and a worthy career, all wrapped into one. continue reading "Become ALL That YOU are Destined to Be!" JESUS IS: Lord God Almighty, Omnipotent King, Lion of Judah, Rock of Ages, Prince of Peace, King of Kings, Lord of Lords, Provider, Protector, Paternal Leader, Ruling Lord and Reigning King of all the universe. He is Father, Helper, Guardian and God. He is the First and Last, the Beginning and the End. He is the keeper of Creation and the Creator of all He keeps. The Architect of the universe and the Manager of all times. He always was, is, and will be: Unmoved, Unchanged, Undefeated, and never Undone. He was bruised and brought healing. He was pierced and eased pain. He was persecuted and brought freedom. He was dead and brought life. He is risen and brings power. He reigns and brings Peace. The world can't understand Him, the armies can't defeat Him, the schools can't explain Him, and the leaders can't ignore Him. Herod couldn't kill Him, the Pharisees couldn't confuse Him, the people couldn't hold Him! Nero couldn't crush Him. Hitler couldn't silence Him, the New Age can't replace Him and Ted Turner can't explain Him away! He is light, love, longevity, and Lord. He is goodness, kindness, gentleness, and God. He is Holy, Righteous, mighty, powerful, and pure. His ways are right, His Word is eternal, His will is unchanging, and His mind is on me! His is my redeemer, He is my Savior, He is my guide, He is my peace, He is my Joy, He is my comfort, He is my Lord and He rules my life. I serve Him because His bond is love, His burden is light, and His goal for me is abundant life. I follow Him because He is the wisdom of the wise, the power of the powerful, the ancient of days, the ruler of rulers, the leader of leaders, the overseer of the over-comers, and the sovereign Lord of all that was, is and is to come. And if that seems impressive to you, try this for size. His goal is a relationship with ME! He will never leave me, forsake me, mislead me, forget me, overlook me, and never cancel my appointment in His appointment book! When I fall, He lifts me up. When I fail, He forgives me. When I am weak, He is strong. When I am lost, He is The Way. When I am afraid, He is my courage. When I stumble, He steadies me. When I am hurt, He heals me. When I am broken, He mends me. When I am blind, He leads me. When I am hungry, He feeds me. When I face trials, He is with me. When I face persecution, He stills me. When I face problems, He comforts me. When I face loss, He provides for me. When I face Death, He carries me Home! He is everything for everybody, everywhere, every time, and in every way. He is God, He is faithful, I am His, and He is mine. My Father in Heaven can whip the father of this world, and so, if you're wondering why I feel so secure, understand this: He said it, and that settles it. God is in control, I am on His side, and that means all is well with my soul. Listen to Church Sermons Online for FREE! You can now hear the Word Of God preached 24 hours a day, 7 days a week. Whether you are at work or at home or you can't make it to church that day; you can now enjoy listening to men and women of God deliver Bible based messages. (2) to keep our Christian brothers and sisters around the world encouraged, strengthened and focused on their daily walk with God. Right now, there are over 250 sermons available for you to enjoy. continue reading "Listen to Church Sermons Online for Free"
The 40 Day Miracle involves abstaining from or counteracting the 7 deadly sins (pride, envy, gluttony, lust, anger, greed, sloth) for a period of 40 days. These 7 sins have long been recognized by the church as the 7 basic human behaviors and emotions that cause most of our destruction and spiritual downfall. The Daily Proclamation sums up The 40 Day Miracle. 40 is the Biblical number of major change and preparation for destiny. Often when God wanted to prepare someone for a truly great destiny, He took 40 days and sent them through an experience somewhat unpleasant to the flesh. We all deal with the 7 deadly sins but rarely is there an organized program to specifically give us the power to conquer them and take our lives to a new level. If we examine our lives closely, we will see that virtually all of our misery and unhappiness results from one or more of these 7 deadly sins. If you don't think so, then listen to the seven messages (bottom of page) and you will see how they are involved in our pain. When you can conquer something for 40 days, you will have the power and the knowledge to conquer it forever. Do you want the miraculous in your life? Visit The 40 Day Miracle. continue reading "40, Biblical Number - Prepare for Destiny!" Behind many people's smile is a world of hurt. Do you feel as though your life is spinning out of control? Do pressures, temptations and circumstances overwhelm you? On the outside you may be smiling, but on the inside you hurt. Living Free Radio offers messsages of real hope with real problems. Try Living Free® Radio...today! You can listen online, download MP3s or even subscribe to our Podcast. continue reading "Living Free Radio"
'Into Thy Word Ministries' to help equip and encourage you to grow deeper in your walk with Christ and impact others around you. Their Purpose is to point to the Supremacy and Centrality of Christ, and with your partnership they can expand God's Kingdom by becoming and developing wholeheartedly, fully-engaged followers of Jesus Christ. Into Thy Word Ministries has a large and comprehensive Christian Website filled with solid Biblical discipleship tools. Check it out! You are also encouraged to sign up for their newsletter. The purpose is to bring you their new Bible Study and highlight a few of their 1,000 plus resources for your devotions, personal growth and teaching. Each Monday subscribers will receive a serialized installment of the current Bible Study, (we are currently studying Revelation) and you can receive all this via e-mail. All are invited to join, regardless of their church or denominational background. The purpose is to challenge one other to learn and grow in the Word of God as iron sharpen iron (Psalm 37:17). continue reading "Into Thy Word Ministries"
Prayer Guide for your Church and Pastor! Do you desire to fire your pastor? Perhaps you should FIRE THEM UP instead! Do you want to leave your church? Perhaps you should be the one to BUILD IT UP! The best way to build your church and fire up your pastor is to be involved and pray for them constantly and continually! If you really what to put your faith where it is needed the most, commit yourself to support your Church and Pastoral Staff, and realize that God loves us all, and we are still in His Hands. Pastors and church leaders face many opportunities and challenges each day. They balance the stresses of ministry while they are researching and writing the sermons, managing the affairs of the church, going to countless meetings and counseling others significant problems. They wear many hats as the pastor, priest, counselor, preacher, teacher, manager, organizer, visionary, administrator and janitor all rolled into one with little to no free time. As well as dealing with the stresses of modern life with their family all under personal attack and usually doing life with a lower salary and an ungrateful congregation who expects them to be perfect. They need your help, they need your prayers! When we commit ourselves to pray for our pastors and church leaders, we will have no need to bicker, gossip, slander, withdraw, place blame, or seek to usurp our will as God’s (Rom. 8:28, 8:33-34, 37-39). For our confidence in the fact Christ is our Sovereign Shepherd and He is in complete control of our church and staff, we are in His Hands and all will work out. Our pastors and leaders are here to serve, but they need our prayers and support to make this work! When we pray and come together tighter, we will have no need to fear or stress or remain in our hurts. We can come together triumphantly as a caring, loving community powerfully for His glory impacting our community (Isa. 6:1-12; Gal. 5:22-23; 1 Pet. 3:12)! Praying for your church is like filling a balloon with helium, the more it is filled, the more it will soar and not sore! For us to grow not just numerically, but in what is much more important, spiritually and in community to one another, requires our discipline and passion to pursue Christ more and ourselves less. We have to grow in Christ in a cherished, intimate growing relationship with Him as LORD over all and LORD over us. We are called to become purpose driven with His purpose at our helm of leadership and lives so that our trust and intimacy is rooted in Him and not in our personal ideas or distractions (1 Chron. 16:11; John 3:30;Eph. 6:16; Col. 2:6-8). Go here to receive your Prayer Guide. Use this prayer guide to pray daily for your church. It is God’s call for all of us to Pray for our Church and Pastor! You are welcome to print the prayer guide out and pass it to those in your congregation. Watch your church grow closer to Christ! continue reading "Downloadable Prayer Guide"
Deborah Lovett is Executive Director of Women of the Well Ministry. God has called her beyond a shadow of a doubt to equip women-- person by person, church by church, city by city. She desires to educate women on how to ADVANCE to overflowing with a genuine, authentic joy that is contagious; thus attracting others to Jesus! Deborah is the author of Gushing Springs, a devotional book for women. The hot noonday sun beat down as the Samaritan woman made her way through the quiet streets of Sychar toward the well. She carried more than the burden of her water pots. She also shouldered an oppressive sense of shame,rejection, and guilt. The only world she knew was one of broken promises, hidden agendas, and disappointments. As hard as she tried, she couldn't forget her longing for real love. To her surprise, a man was already standing at the well. He initiated a conversation, and she soon learned he was different from anyone she had ever known. At the well that day, she found the refreshment of hope, forgiveness and freedom as she drank her new friend's Living Water! Gushing Springs is a book of 35 "motivationals"--250 pages, which can also be experienced as a seven week study, or simply read through as a novel. Learn who the "author and finisher" of your faith is, by encountering Jesus verse by verse, as you journey to the well yourself, through John Chapter Four. You will be replenished and restored and then you too will gush springs that splash Living Water. There is so much more to this story than what meets the eye. Find out more about Deborah and Women of the Well. * All information taken from Women of the Well website. continue reading "Advance to OVERFLOWING!" Gospel Transformation is a 36-lesson inductive study focusing on what matters most – our ongoing need for the transforming power of the gospel. Intended for use in small groups or personal study.
. . . and much more . You can find out more at World Harvest Mission; a ministry that exists to see individuals, families, communities, and cultures so changed and renewed by the gospel of grace that they passionately pursue their role in the great story of redemption! continue reading "Just in Time for Easter. . ."
continue reading "Beyond the Veil"
The Marriage Monday meme meets at Chrysalis the first Monday of every month. Similar to a group writing project or blog Carnival, contributors post their thoughts on an agreed-upon topic, and then add their permalink to Mister Linky. Marriage Monday at Chrysalis offers an opportunity to share your wisdom, Scriptural knowledge, experience, quotes, or other insights. You are welcome to approach this vital subject from any angle that you feel led. The idea is to promote some vigorous thought and discussion; therefore, all points of view are welcome and encouraged. If you are new to Chrysalis, you are welcome to jump right in! The next Marriage Monday is on April 7, 2008. The topic will be "Marriage: For Happiness or Holiness?" "The Bible reveals that God has provided special truths that can change lives and uplift the spirit. Often those truths lie dormant and untapped within the soul. The Secret Things of God reveals twenty profoundly simple secrets and gently guides you to unlocking these powerful truths and how to apply them to your hearts and lives." continue reading "The Secret Things of God"
Think You Need to Be A Prayer Pro? every tear we cry in God's presence is prayer." Now, Sheila Walsh answers YOUR QUESTIONS about prayer! with Thomas Nelson and hosted on GodTube.com. Already a GodTube registered user? Click here to go directly to the Sheila Walsh chat room! NOTE: chat room will be live 30 minutes prior to the event. continue reading "Sheila Walsh Video Chat on Prayer - TODAY!" Who never took a stand? A child that He set free? To brighten up their day? That dwells inside of me? Is He right there in my grip? That steadies when I slip? So gentle and so kind? continue reading "When Jesus Looks..."
Now I'm found and forgiven. I still feel the sting of pain..
continue reading "Christians Aren't Perfect..."
Do you have a longing inside to know God more deeply? Do you long for the peace and joy that ONLY God can give? Developing a HUNGER for God’s Word is your KEY to unlocking your relationship with Him that your heart longs for. The Hem of His Garment offers a wide variety of Bible studies to assist you in drawing closer to God. Your Bible study time is a source of intimacy with the Holy Spirit, drawing you into a close communion with God. Ready to take your Christian walk to the next level? Enjoy the journey of transformation with your God! Transform your computer into a Spiritual Oasis! Stop by The Hem of His Garment; check out the many AMAZING RESOURCES they offer to strengthen your walk with God. I know you will want to bookmark this site! continue reading "Develop a HUNGER for God's Word"
A Cure for ?Soul Cancer? Soul cancer--unforgiveness--is like a tumor with ugly tendrils growing into every aspect of our lives. Don't be lulled into complacency: "Soul cancer" has the power to destroy you. Here's the good news: The Great Physician promises to weld His scalpel to free hearts diseased by betrayal, lies, and other sins. Restoration can begin as we release our unforgiveness to Him. 1. Ask God to reveal your most private soul cancers. As David said, "My thoughts trouble me and I am distraught at the voice of the enemy... I call to the Lord ... evening and morning and noon, I cry out in distress and He hears my voice" (Psalm 55: 3, 16-17). Forgiveness--it's a conscious decision. This forgiveness process is not for our offenders; it is for our spiritual health alone. Can you give up all claims to revenge? Anger and resentment? Nope. Most of us are not capable of this measure of forgiveness. But God is able to help us become capable. Yet, we have to know where the cancer is--acknowledge that it exists--to begin the healing. Ask God to x-ray you to reveal any hidden soul cancers. Strange fact about God: He prefers a cooperative patient so that you and He can move forward to the next healing step. 2. Acknowledge unforgiveness' toxic nature. "But you, O God, will bring down the wicked into the pit of corruption ... But as for me, I trust in you" (Psalm 55:23). Satan uses unforgiveness to gain entrance first into our souls and then our lives. Unforgiveness can poison our whole being. It can cause spiritual death. We must be dedicated to the health of our souls, which includes being rid of soul cancers at all costs. The cost? The Great Physician's bill? It was paid on the cross for you. Jesus donated His own blood for your healing. That's how important your soul health is to Him. Shouldn't it be at least that important to you? 3. Understanding that healing is a life-long process, daily surrender your soul cancers to God. "Cast your cares (soul cancers) on the Lord and He will sustain you" (Psalm 55:22a NIV). Some cancers can be cured quickly. Some require long-term treatment; perhaps months or years. As God works in you, you'll discover the soul cancer is losing its grip. It's not magic. Its God's healing process. Know this: God wants to breathe new health into your soul. He will give you a new heart and put a new spirit in you. For your health, every time you taste the bile of unforgiveness, your job is to surrender it, report the flare up to the Great Physician, and ask for His healing touch. You can witness your transformation in real time while God transforms you from unhealthy to healthy. And holy. The Lord wants every part of you to be cancer-free, empowered, strong, unencumbered, with soul health like you have never experienced before. Great Physician, heal me. Do what you need to do to cure me of unforgiveness toward ___________(name of person). I was hurt when he/she ________________ (name of offense). It made me feel ______________ (unloved, unworthy, dirty, betrayed, misused, etc.). But because all things are possible through Christ Jesus, I hereby consent to healing from the soul cancer of unforgiveness. Through the power of Christ Jesus, I forgive ________ (name of person). I surrender the sin and pain to you, Lord. Want a cancer free soul? Start today by leaving judgment, resentment, wrath, and revenge in God's hands. Subscribe to Live It! a free newsletter from Crosswalk.com. Jan Coates is the founder and president of http://www.setfreetoday.com/, a ministry where you can come as you are and leave with a new beginning. Jan is an author, speaker and consultant. She is a frequent conference speaker and appears on national television and radio programs. To schedule Jan for your next event, please email her at jan@jancoates.com. Rebekah Montgomery, author/speaker/teacher, is a gifted, dynamic communicator. She is the author of more than seven books and has penned 1,100 articles. She shares tough real-life topics and biblical application in a simple easy to grasp manner. To book Rebekah for your next event visit http://www.rebekahmontgomery.com. Rebekah is also the executive director of Set Free Today ministry. The imperfections of the Body of Christ seem to bother me more than most Christians. It is not that I am legalistic or a crusty, mean ole Christian judging everyone I meet. Rather, after having studied the Scriptures for three decades, I have come to realize that we, as a Body of Christ, can be what the Word of God calls us to be. Sometimes I wonder why the LORD has allowed me to see so many imperfections because other Christians and pastors seem blind or oblivious to this deficiency of holiness. I believe that the LORD has opened my heart to be bothered by the sins of His people so that I might preach against it and encourage the Body of Christ to live a holy life as prescribed in the New Testament and to pray for the Body of Christ. What is really unique though is that He has blessed me with a perfect church. Okay, not really...But the closest I’ve seen. We all know there is no perfect church because people are not flawless. We all have our weaknesses and flaws and those enter into the Body of Christ. Yet, as I have sought the LORD about my own congregation’s growth, purity and maturity, I believe the LORD has shown to me that it is possible for every church to become healthy and strong, to turn from sin, and to avoid even the appearance of evil. I believe if I had never observed a congregation's growth and health like this, then I might think it would be impossible and find the work of a pastor hopeless. Words are powerful and have great influence. The Word of God is just that...Words from God have power to influence us to change from living unholy lives and move us to live our lives to please God. This is why I preach and teach the Word of God. I really believe with all my heart, soul and mind that by proclaiming the LORD'S Word that hearers will be set free from sin and rise up in the power of the Holy Spirit to live a victorious life in Christ. I really do! Yet, I believe that the Body of Christ cannot live a victorious life until she has truly repented of sins, and has decided to live 100% for Jesus. When the Body of Christ is unequally yoke...living for Christ and for the world...well Jesus said, "No one can serve two masters. Either he will hate the one and love the other, or he will be devoted to the one and despise the other. You cannot serve both God and Money" (Matthew 6:24). Paul said, "Do not be yoked together with unbelievers. For what do righteousness and wickedness have in common? Or what fellowship can light have with darkness? What harmony is there between Christ and Belial? What does a believer have in common with an unbeliever? What agreement is there between the temple of God and idols?" (2 Corinthians 6:14-16). I heard yesterday that only 7% of Christians hold a Christian worldview. This means that 93% of the Body of Christ is in the world and of the world. Someone has to preach and teach to this great need. 93% of the Body of Christ has not been transformed by the renewing of their minds and are still living according to the patterns of this world (Romans 12:1-3). So yesterday in my prayer time I, once again, became burden for those perishing without Christ. I begin to pray for opportunities to preach to the lost and speak the Truth in love to the Body of Christ. I thanked God for allowing me the privilege to see beyond the surface of the Body of Christ, and see shortcomings, sins and disobedience, and for giving me the strength to speak His Truth, encouraging the Body of Christ to truly be prepared for His soon return. It is like this, if all of my six children were in the kitchen and one of them burned their hand on the stove, the first thing I would do is attend to the child that was hurt. But soon, I would gather all six children together and warn them not to burn themselves. The one who did get burned might say, "Hey, you’re talking directly about me!" Not really, but having seen what can happen, does it not make sense to warn the Body of Christ. All through the Bible, time after time, we see this, how someone fell into sin, and others were warned not to do the same thing. Paul warned Timothy to hold on to his faith and endure to the end so that he would not fall away from his salvation like Hymenaeus and Alexander did. "Timothy, my son, I give you this instruction in keeping with the prophecies once made about you, so that by following them you may fight the good fight, holding on to faith and a good conscience. Some have rejected these and so have shipwrecked their faith. Among them are Hymenaeus and Alexander, whom I have handed over to Satan to be taught not to blaspheme" (1 Timothy 1:18-20). I believe proclaiming the Word of God makes the difference between whether someone ends up in Heaven or hell. If I fail to warn the Body of Christ and fail to preach the whole counsel of the LORD, many will go to hell having not heard the Word of the LORD. Many false converts may never truly be saved. So I stand with confidence in the LORD, preaching, teaching, encouraging and warning in Jesus’ Name. It’s who I am. Dear Heavenly Father, what a joy it is to serve You, to preach Your Word and to encourage the Body of Christ. I pray that You will continue to use these daily teachings of Your Word to perfect Your Body, so that we can enjoy a healthy and strong Body of Christ. In Jesus' Mighty Name, AMEN! IF YOU WANT TO BE AN UNDERWRITER, please click here to underwrite an Emed! REPRINT & USE AGREEMENT: You are welcome to reprint and use these daily E-Meditations as you wish provided that you cite original source and website information. SHARE THE E-MEDITATIONS: So many of you pass on and forward these daily E-Meditations. Thank You. Please continue to share these with others. COMMENTS, PRAYERS & QUESTIONS: We love to hear back from each of you. If you have a comment, a prayer need or a question, either reply to the daily E-meditation or email us. Copyright © 1998-2008 Fresh Wind MinistriesE-mail us at:http://ca.f382.mail.yahoo.com/ym/Compose?To=info@freshwind.orgSuggestions, or questions about this site can be directed to the webmaster. continue reading "IMPERFECTIONS of the Body of Christ"
Building the local Church - GLOBALLY! Equip & Empower Ministries exists to serve the local church, leaders, organizations and individuals by inspiring and helping them connect with their God-given potential and purpose. Through conferences, consulting, coaching, as well as media, books and audiovisual resources, we are able to reach a vast range of individual needs within the local church context on a global scale. The message of this ministry is to make Jesus' last command our first priority. Together with our team of partners, we are seeing this mandate fulfilled, and the body of Christ empowered! You are invited to change the world with them! continue reading "Equip and Empower!" continue reading "WOMEN TODAY Chat Schedule"
Each month christianaudio.com gives away a premium audiobook download for free. The way their Free Audiobook of the Month program works is like this: they give away one audiobook download each month totally free. The audiobook they give away is available for free only once - ever. The Augsburg, The Westminister, and the Heidelberg Confessions. Quite simply, these are three of the most important and well-known confessions of the Reformed faith. Concise, yet with excellent detail, there is no better way to get an introduction and background of historic Reformed faith. Add the Download format of The Confessions of the Reformed Faith to your cart and then use the coupon code MAR2008 during checkout to receive this title for free. continue reading "FREE Audio Book of the Month"
How obligated or important is it that you follow the Bible? Within God’s grace, are you given some breathing room to not be so adamant about following everything in the Word of God? Do you really have to search the Scriptures about every decision you make? If you have not been in the Word of God today, you will make wrong decisions and probably have poor judgment at least once throughout the day. If you’ve gone more than a day or two without seek the LORD in His Word, your life is governed more by your flesh and feelings than the standard of God’s Word. And if you have failed to truly seek the LORD in His Word for more than a month….oh my, you are only living for yourself. The Bible was given to us by God, so that we might be able to resist the urge to live according to our own understand and wisdom. The LORD knew we would fail greatly unless we lived according to His standard and make our decision after seeking His principles and knowledge. The LORD has given us His Word so that we will be able to avoid foolish judgment. The counsel of others who are men of the Word is to be sought. Few are willing to ask, because the answer will be obvious. Most, who are not living according to the Word of God know that the Word of God will interfere with their own ambitions. How obligated are we to follow the Bible? Totally obligated! How important is it that we study the Word of God daily and make our decisions based on the Word of God? It is of the utmost importance. Does God’s grace give us breathing room to back off just a bit from His Word and do things in a way that seems right to us? Absolutely NOT! “All a man's ways seem right to him, but the LORD weighs the heart” (Proverbs 21:2). The reason so many Christians depart from the Word of God and pursue their own “revelation” is because other mature Christians failed to speak the Truth of God’s Word directly over their lives. We are concerned about hurting someone’s feelings or that our conversation may be so direct they may quit the church or not like us anymore. So, instead of helping a friend get back in line with the truth, we simply allow our flesh to never bring up their obvious drifting away from the LORD. It reminds me of the Proverb that says, “Answer a fool according to his folly, or he will be wise in his own eyes(Proverbs 26:5). We must answer the fool in his folly, that is we must be able ourselves to know someone’s ways are contrary to Scripture and then we must answer with Scripture. Otherwise, the Bible says they will establish their own way as wise. Seems impossible, but we are all capable of establishing our own fleshly ideas as wise in our own eyes. The devil has launched an invasion upon Christianity, an invasion to lure each of us out of and away from the Bible. And, when we do get into the Word, his second wave of invasion is to cause us to believe that God is so loving and His grace so full, that we are special in that we do not have to actually obey every detail of His Word. This is of the devil. Don’t fall for his tricks. Get into the Word of God, and live your life according to Sound Doctrine. Dear Heavenly Father, deliver us from the evil one who even speaks through pastors and celebrities saying that sound doctrine is not all that important. We know Your Word is our guide, to keep us from making foolish mistakes. In Jesus Name, AMEN! E-mail us at:info@freshwind.orgSuggestions, or questions about this site can be directed to the webmaster. continue reading "Are You Following the Bible?"